Yehey for new planners! Here's another recommended one from Seattle's Best Coffee: the SBC Dream Journal 2015. I like the cover texture, the trapper keeper-ish style of the pages, and also the alanganing color gray made my heart flutter. But the best thing with SBC 2015 planner is the freebies! One sticker is given for each Seattle’s Best Coffee beverage purchase. Cardholder must accumulate 18 stickers to redeem one SBC Dream Journal. The 18 stickers must be composed of 8 holiday drink stickers and 10 regular drink (excluding bottled drinks and water) stickers. Once all stickers are completed, cardholder submits the SBC Dream Card to redeem an SBC Dream Journal from any of the participating Seattle’s Best Coffee cafés nationwide. A combination of up to 2 cards will be allowed as long as the stickers for the 8 holiday drinks and 10 regular drinks are completed with the two cards combined. A customer can avail of the Seattle’s Best Coffee (SBC) Dream Card from October 24, 2014 to January 15, 2015 with no purchase required. 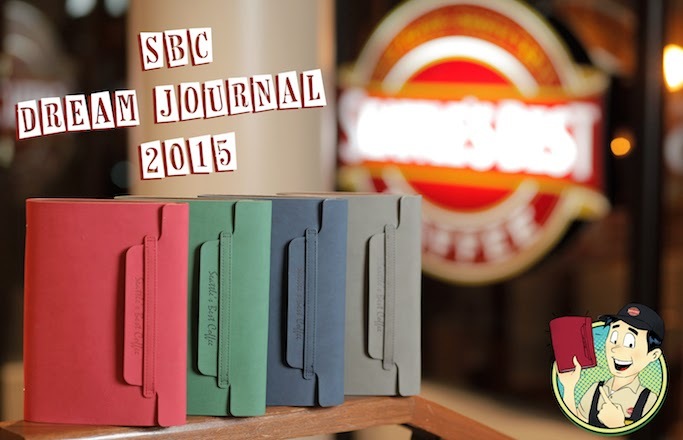 Redemption of the SBC Dream Journal is up to March 16, 2015 only. Like Seattle's Best Coffee Philippines on Facebook for more info and updates! Whatt!!? We can't just purchase it? =( I don't drink coffee but I really like that planner!